Don’t feel like courting danger? Consider adding gutter covers to your home. 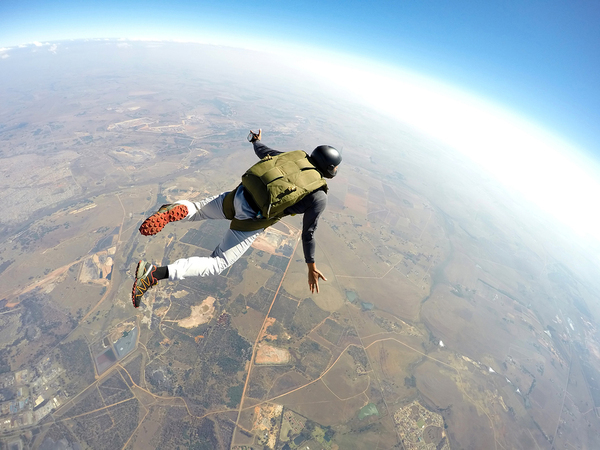 You live for the feeling of danger, but you can’t afford to go skydiving this month. Why not clean your gutters instead? All jokes aside, standing on a ladder cleaning out a blocked gutter can be a dangerous activity. In fact, according to the National Safety Council, falls are the fifth most frequent cause of death in the United States. While not all falls are from ladders, hundreds of injuries and deaths do occur every year due to falls from ladders and scaffolding. These tips will help you prevent injuries. 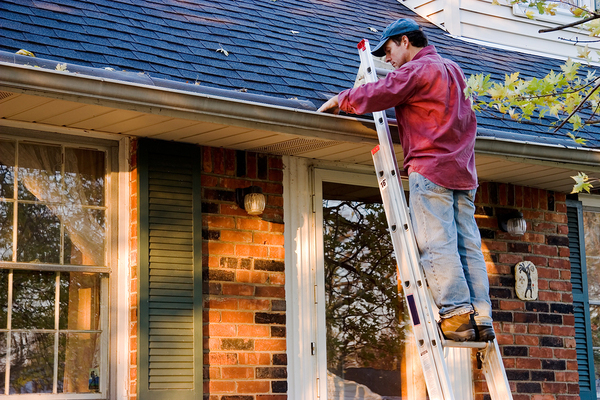 If you’re going to clean out your gutters, prevent it from becoming a contact sport by practicing ladder safety. Some of the elements of ladder safety involve how you act on the ladder. Set yourself up for a safe gutter cleaning: let someone know you’ll be working on a ladder, and use a spotter who can help you in an emergency. Wear proper footwear with a good grip. Don’t overreach, because this can cause you to tip off the ladder. Know that climbing ladders and moving gutter debris is hard work, so stop if you get tired or lose focus. Make sure that your equipment is working – before you climb. Check your ladder before you use it to make sure it’s in good working order and opens and locks properly. If you’re going to collect debris in a bucket, make sure that your ladder has a shelf for the bucket so that you have both hands free. Use a strong, four-legged step ladder for a single story or an extension ladder for a taller building, and avoid wooden ladders or orchard ladders. Fiberglass and aluminum ladders tend to be the sturdiest ladders for the job. When you’re cleaning your gutters, other hazards can interfere with your focus and cause you to lose your balance. Wear gloves so that you don’t cut yourself on rusty or loose metal, and protect your eyes from sludge and debris. If you’re working around trees or power lines, stay far away from them, and consider pruning branches before you start cleaning the gutters. No matter how safe you try to be, if you’re climbing on a ladder, there is some potential for injury. Why climb onto the ladder to do gutter cleaning when you can choose a safer solution? There are two easy solutions to your gutter cleaning woes. You can hire someone to clean your gutters. With professional equipment and experience, professional gutter cleaners may have more success cleaning your gutters than you would with your old ladder and your spouse holding on at the bottom. However, gutter cleaning comes with a cost, and, if you have many leaves, blossoms, and sticks in your gutters, it may need to be done more than once a year. The other option is also safe, but it doesn’t involve ongoing costs. When you install gutter guards, you prevent leaves and other debris from moving into your gutters in the first place. A gutter guard that relies on surface tension is particularly effective, because it prevents even small debris from slipping into your gutters. While there is a cost for the initial installation, you don’t need to worry about balancing on a ladder in the rain, the heat, or the cold. If you’re tired of cleaning your gutters, try Gutter Helmet. View our photo gallery and contact us to learn more about gutter guards.